Dana Markos Events; Event Design and Floral Styling: Holiday Wreaths! 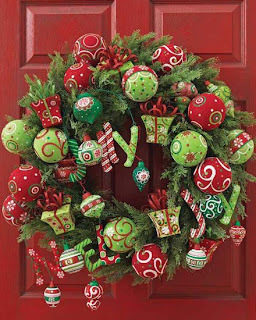 There are so many different types of wreaths nowadays besides just the traditional ones made out of evergreen branches! A few different holiday wreaths that we've seen this year have been made using holiday ornaments, burlap, presents, peppermints, and many more! There are always wreaths being sold in stores, but making a wreath yourself this year could be a fun activity you could do with your friends or family! Check out this blog http://matt-and-becky.blogspot.com/2009/12/12-days-of-christmas-crafts-day-5.html , it shows an easy way to create a wreath out of ornaments. The first thing you do is get a styrofoam ring and ornaments of all different sizes. You want to take off all the hanger wires off the ornaments when you glue them onto the styrofoam ring. Start with the larger ornaments first, then just keep adding the ornaments around as evenly as possible to fill in the open spaces. Another way to create your own wreath could be using burlap! Using burlap may sound a little strange, but as you can see it can create a beautiful wreath with a rustic charm! Something so simple, to decorate it would be using pine cones, a few accent ornament pieces, and you can always attach holiday sayings such as "Joy, Noel, Merry". For those that love the traditional wreaths, you can add some different things to make yours especially unique! Many places selling Christmas trees often sell the evergreen wreaths but with no decorations at all. This is where you can really be creative with your wreath and add whatever you think will look great! 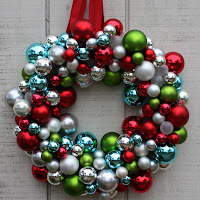 A cute thing you can do is paint styrofoam balls in festive colors to add to the wreath. In addition, adding a bright ribbon onto the wreath to really draw your attention! 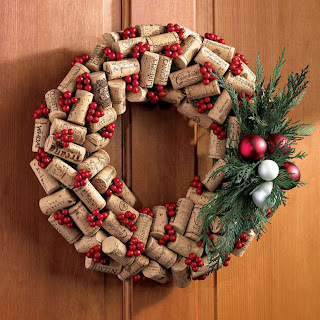 Another great idea for all of you wine drinkers out there is using corks to create a festive wreath. This is a wreath that can be hung year round and is also a great way to use up those extra corks you have around the house! 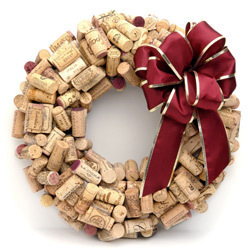 All you have to do glue the corks to a styrofoam ring and add a festive bow for the holidays. If you are feeling really creative this year you can always add some red berries and some clippings from your tree as well! Whatever you choose to do, just remember to have fun decorating!